← Scrumtious Rice Krispie Squares to Die for! 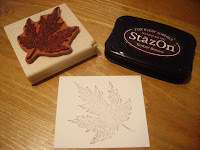 The first thing you’re going to do is to stamp the image with StazOn ink. It needs to be StazOn when you’re working with water as the other inks will blend in with the other colors and you’ll lose your image. Scribble 2 different colors of Tombow markers onto the image leaving a good amount of white space. 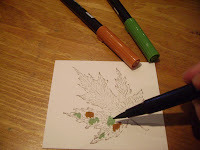 Here we’ve inked the edges of the cardstock with the “direct to paper” technique. 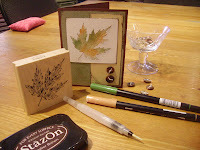 It’s just a matter of using the inkpad directly to the paper instead of a dauber or sponge. 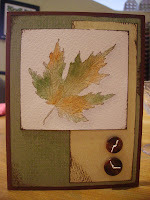 Adhere all your pieces to your cardstock and add your buttons to accent. 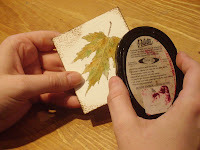 This entry was posted in Neat 'Nique, Tutorials and tagged Tombow Markers, Tutorial, Watercolour. Bookmark the permalink.